The Buds leadership camp for 2015 was organised on the theme Awake, Arise and Shine at House of Peace, Yercuad from 26th to 30th of May 2015. 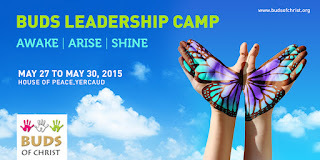 The leadership camp is primarily organised in building future leaders from the families reached through Buds of Christ to reach out to young children and youth belonging to challenging circumstances. The camp outcome is to enable the youngsters to focus and encourage young people like them to live the future with hope and courage. The main aspects of the camp were on motivational sessions by external consultants, action songs, dance and reflective (personal and group) exercises that enabled the participants to be more involved in the learning. The First day themed AWAKE: The participants were guided in understanding their self worth through demonstrative sessions by Mr. Santharaj from Salem. The key learning the participants gained was each one has been born with potential that is masked by low self worth that is projected through shyness, considering one as incapable for the task, fear of being open etc. He encouraged the participants to look into their inner self and be proud of the uniqueness in oneself. This was followed by exercise on the Tree of life (a manual developed by REPSII, South Africa) that was adapted in helping the participants look into the special abilities each one possesses. The compilation of all the trees was set as the forest of life. This exercise helped the participants look into the other part of their life, focusing on their strengths, talents and skills. They also acknowledged the key roles played by their well-wishers. At the end of the exercise the participants become more enthusiastic especially when their peers shared the qualities they observed in each other. The second day themed ARISE: The participants gained an understanding on the fears and challenges that overwhelm them. The session lead by Dr. John Daniel Ph.D, helped the participants understand the internal (self -made) challenges that affects once progress. He outlined four areas, Lack of knowledge, lack of accountability, lack of enthusiasm and lack of commitment. This enabled the young people reflect on their own personal experiences and make decisions that will make them move forward. Following participatory discussion on the challenges they experience and overcoming them, a reinforcing session on practical ways to arise out of the existing situation was explained with illustration. The final session of the day was setting up personal plans and guided by a mentor. The third day themed SHINE: The participants were oriented on the need to change and I was stressed that the change should come from them and should be with strong willingness. The session was followed by a group exercise where the participants reflected on the shining moment where they have felt good and some moments where they been a shining moment for others. On reflecting the two instances, majority expressed that it is more satisfying when they have been the cause of shine for others. “Having failed in my public exam, I could not continue studies after my 10th. So I got trained in beautician course and with that skill I am working in the parlour. In that earning, one of my friend who wanted to do higher studies was in financial need for continuing her education, I was happy that I could be of help and offered support” - expressed a young person. At the end of the day, each participant were involved in setting a social goal that would help other children and young people coming from challenging circumstances. The session then ended with a commitment which was shared by the participants in open.